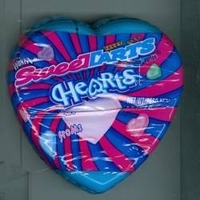 Wonka sweet tart hearts in a heart shaped box. Each plastic heart shaped box is filled with tangy heart candy. These are a perfect way to show you care for you sweet heart. If you are looking for a sweet and tart treat these are great, they are also a great for a valentine exchange as you can write to and from on them . Each heart is 2 oz, color of heart will be either blue or pink.